When a Tian dragon jouster named Ari notices Vetch’s plight, he rescues him and takes him as his own servant. Now Vetch is a dragon boy, feeding and cleaning up after his new master’s dragon. In the process, he learns everything there is to know about caring for dragons and his new circumstances are comfortable and far superior to his previous enslavement. However, Vetch is treated like a serf by the other dragon boys and, worse, he feels guilty working for the enemy, so his situation is not sustainable. He begins to plot his escape… on a baby dragon that he’ll secretly raise right under the noses of his enemies. Joust (2003) is a simple and mostly pleasant story. Vetch’s constant anger and repetitive thoughts and complaints become tiring, but the story moves fast and is easily digestible. It’s easy to be outraged at the cruelty with which Vetch has been treated and to root for him to come up in the world and get revenge (a very common plot device for Lackey). I’m not one of those fantasy readers who can’t get enough of dragons — I can take them or leave them — but I loved Lackey’s dragons in this story. Especially the dragonets. They were by far the best characters and my favorite part of Joust. Some of the plot of Joust just doesn’t make sense to me. For example, if the dragons are so valuable, why do the Tians destroy their eggs instead of hatching and raising the dragonets? There’s a reason given (it takes a lot of time and work), but it’s not at all believable, especially since Ari (the best jouster) has done it before and they can all see the success he’s had. Why not just hire a bunch of dragon boys to raise baby dragons and become the next generations’ jousters? The only reason not to is that it doesn’t fit with Lackey’s plot. Another issue is that Vetch is just so lucky. Tension doesn’t last long and things seem to fall into place for him. 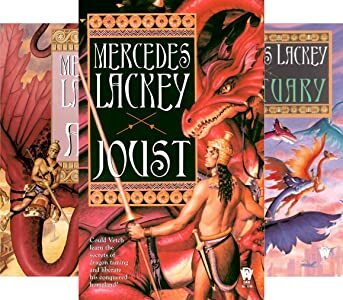 However, the truth is that though I can clearly see all the flaws in Joust, I still really enjoyed the story and, when it was over, was ready to pick up Alta, the second book in the DRAGON JOUSTERS quartet. 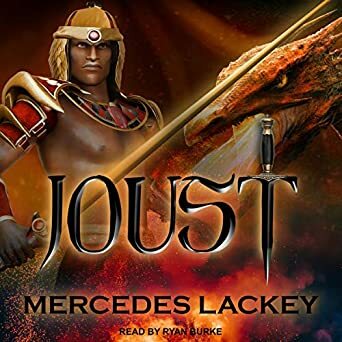 Tantor Audio has just released an audio edition of DRAGON JOUSTERS and I love the narrator, Ryan Burke. The audiobook is 13 hours long. I recommend this version. Too bad the cover art is so awful. Published in 2003. National best-selling fantasy author Mercedes Lackey creates a vivid, dynamic fusion of the cultures of ancient Egypt and legendary Atlantis with the most exciting and believable portrayal of dragons ever imagined.The first book in this thrilling new series introduces us to a young slave who dreams of becoming a jouster—one of the few warriors who can actually ride a flying dragon.And so, in secret, he begins to raise his own dragon.